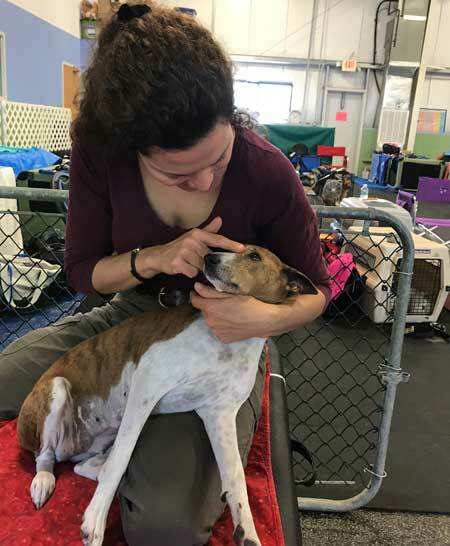 Susan Marsicano's Liner got his SGRC3 and Tutu got her SGRC5!!!!!! They are husband and wife. DC Apu i Liner RN SC CAA TKN FCh SGRC3 ORC JOR VB & FC Apu Pi De Deux SC CA SGRC5 SORC4 ORT PVB. Liner got his CAA title and won a nice silver plate from HRVHA. 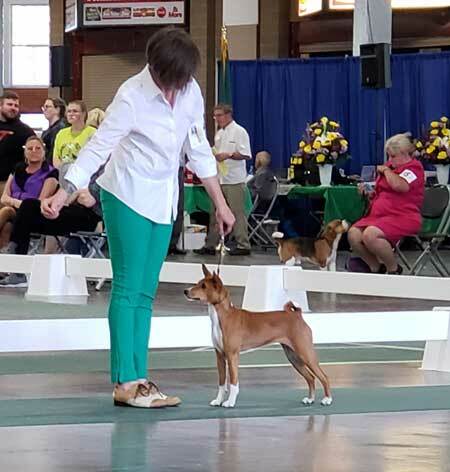 Susan Marsicano's Fern got a 1st Place & a 2nd Place in FAST (2 Qs to her Master FAST Bronze - certainly the first basenji to ever do that) + a 3rd Place in STD in a big 16" class, a couple QQs, etc. 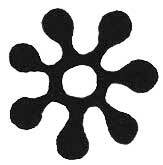 CH MACH Apu Painted Sand RA MXS2 MJC MXF T2B2 THD CL3 RS-N JV-E GV-N SC TKN FCh SGRC ORC SOR CGC TDIA VBE. 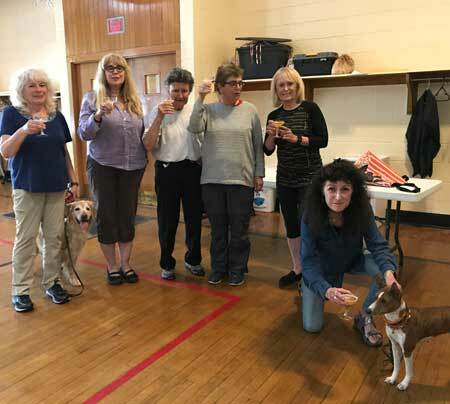 photo is Fernie with Becky Therian. 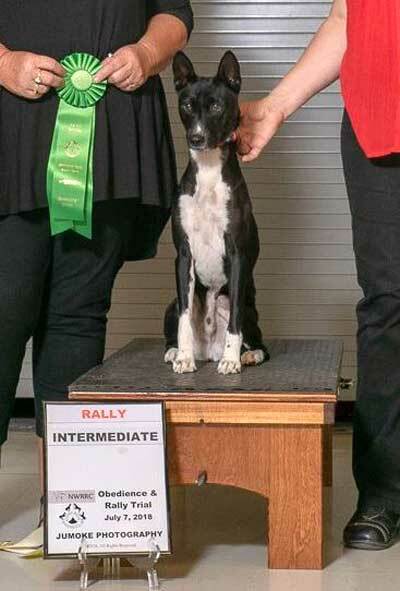 Brenda Phillips's Nike got a 3rd place in Rally Intermediate. 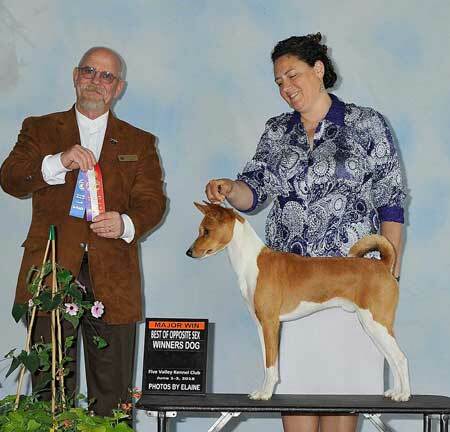 UKC Ch AKC FC Makindu Kiss The Sky SC TKA RATI "Flynn" earning his first AKC Major under judge Gary Newton. Karen Christensen's Tutu - SGRS5!!!! Margaret Howes added the "perfect" Rize to the family. Linda Butterworth's keeper is Fallon. 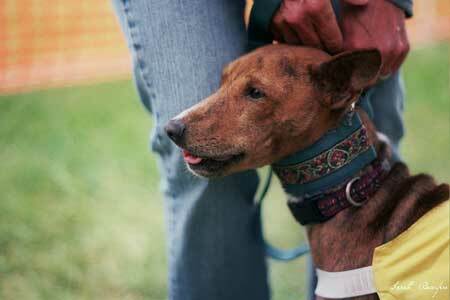 Anne and Don MacMillan adopted the pretty Zeny! 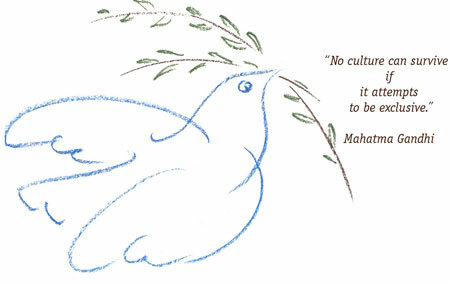 "Now we have 4! Two are almost 15, we knew whenever we lost one we would try and find one Lucky’s age as a companion for him. 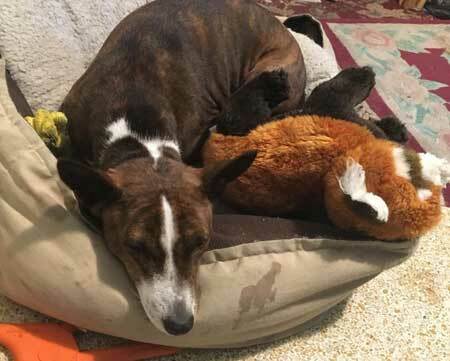 Then Zeny came along and they are a bonded pair. Hadn’t planned to have 4, but can’t pass up such a perfect fit in our family." 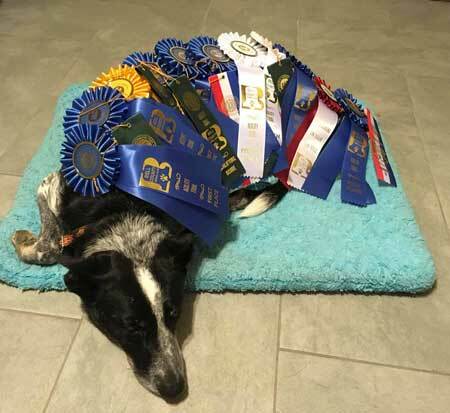 Wendy Hodges' China Blue has a pretty GOOD WEEKEND!!!!!! Our dear friend, Allison Vicuna, in a long battle with ovarian cancer, but now accepted into a trial. Yay for that ! Paul Mount's Zuri is MACH3 and on her way to the record and MACH4. 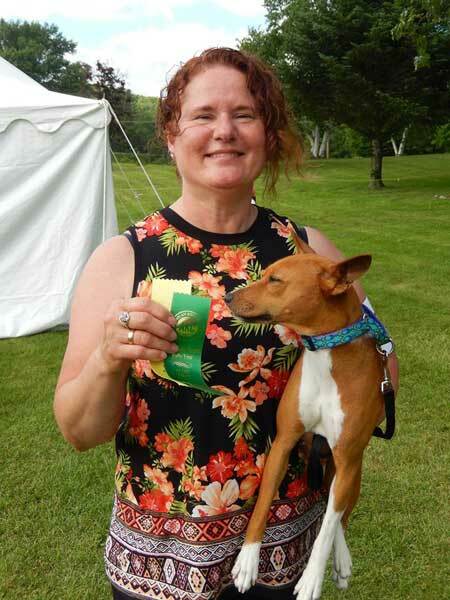 "With her Q and First Place on June 1st in Premier Standard, Zuri earned the PAD - Premier Agility Dog title. 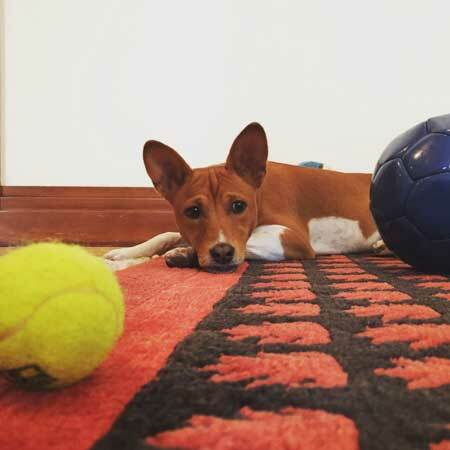 We believe she is the first Basenji to earn this title." MACH3 Fly'N Hi's Pretty Amazing JC MXC MJC OF T2B CGC. 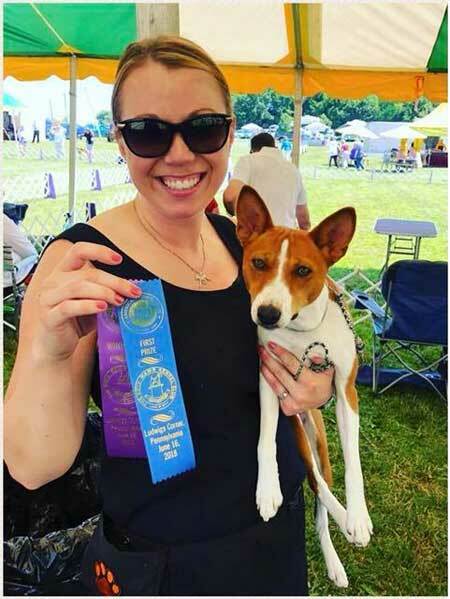 Heather Cruzate's Jingle got her Trick Dog Novice title. 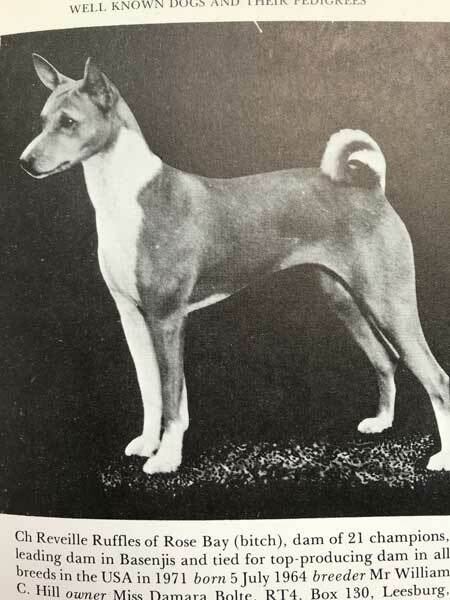 GCH Sundiata's Tezeter TKA BCAT (Achiever Dog). 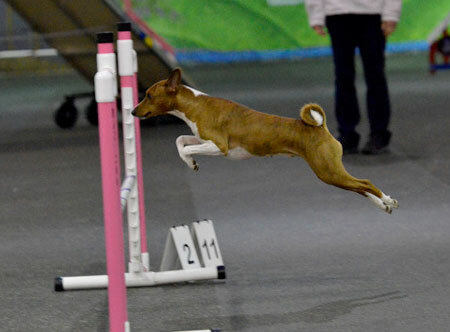 "I've been reviving my childhood equestrian eventing aspirations with this impressive little basenji, Jingle. 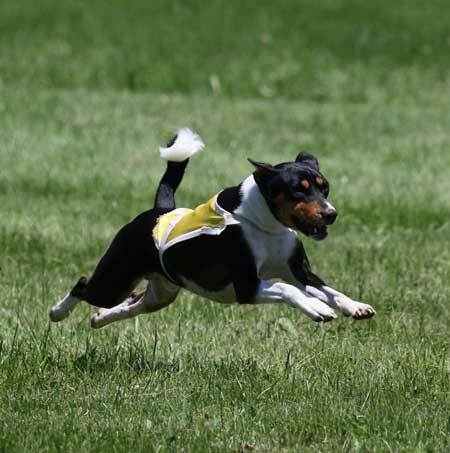 Like 3-day eventing, few breeds possess the movement, confirmation, agility and stamina to soundly compete across athletic disciplines. 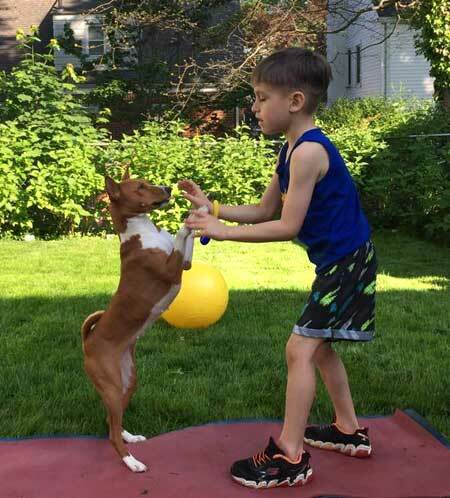 I've been enjoying learning from this clever basenji, watching her use her profound instincts, and pushing our versatility as a team." 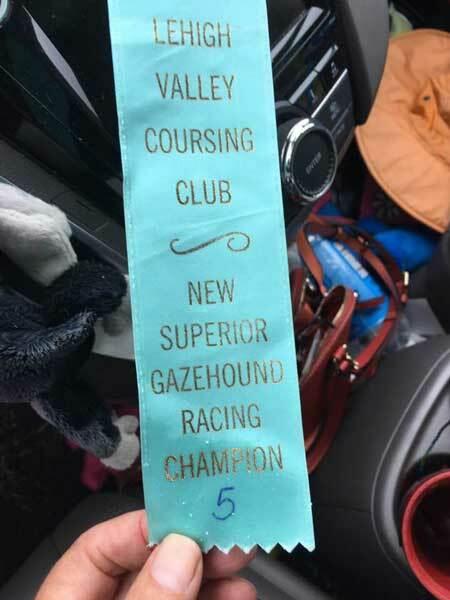 Sue Schulz' Hanna got her second Novice Rally leg. Oh, and a 4 point GCH major. UPDATE! 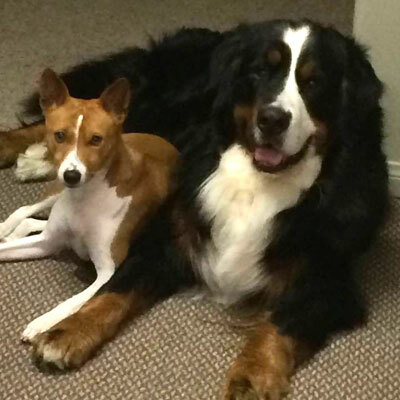 "So very proud of Kojak and Hanna!! 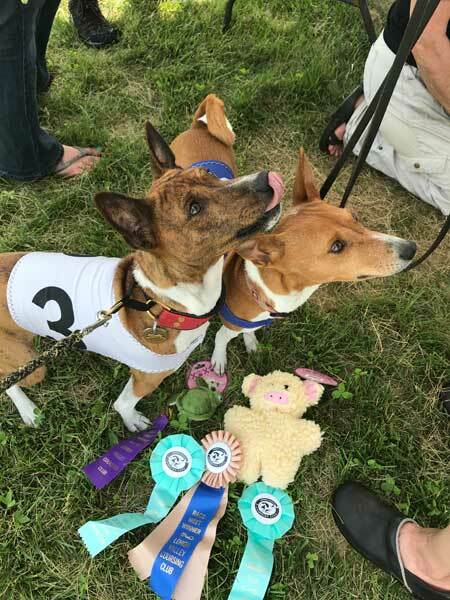 We went to the Susque-Nango Kennel Club Rally Obedience Trial in Binghamton, NY. They both performed qualifying runs, Kojak earning an 87 and Hanna earning a 96! (This is out of a possible 100 points). Hanna gave me an "atta girl!" for doing all the signs right this time!!! Thank you to Judge James Ham. He was very nice and made it fun to be in the ring. 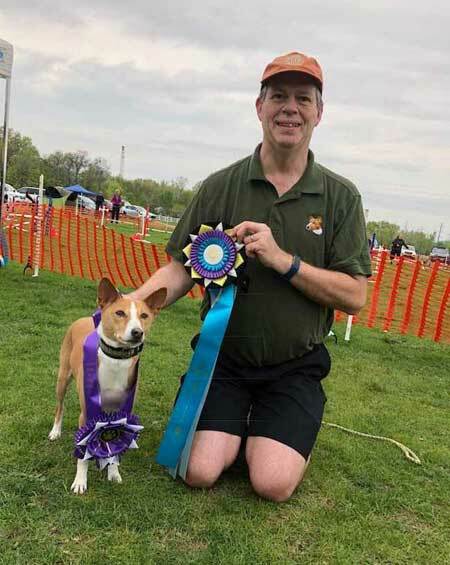 Kojak and Hanna earned new AKC titles, Rally Novice (RN). 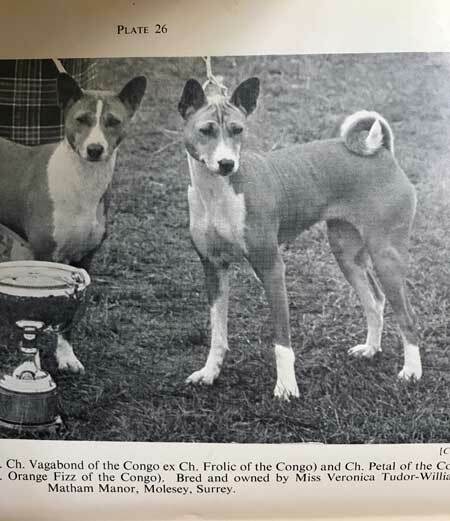 Kojak, GCH SunDiata's Pickwick Edition RN CGC THDN and Hanna, GCH Destiny's Pickwick's Simply Bliss RN CGC. 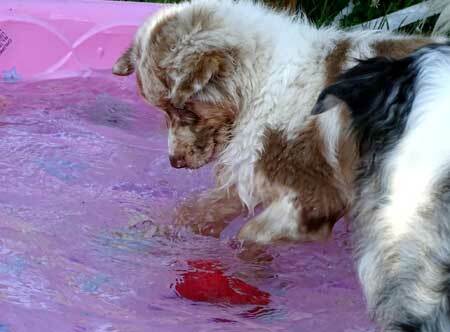 Such fun dogs!! Love them so!" 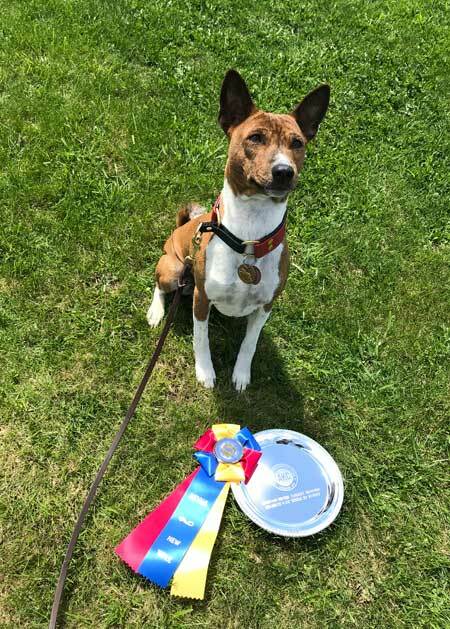 Lizabeth McCargo's Kyndle (SunDiata Bellator Cherry Pi) finished her AKC championship at the Bryn Mawr Kennel Club!!! Back to back four point majors to finish. Linda Butterworth's Aeden got his Master Jumpers Siver title with a run of 24.03 seconds. He got his 7th QQ. 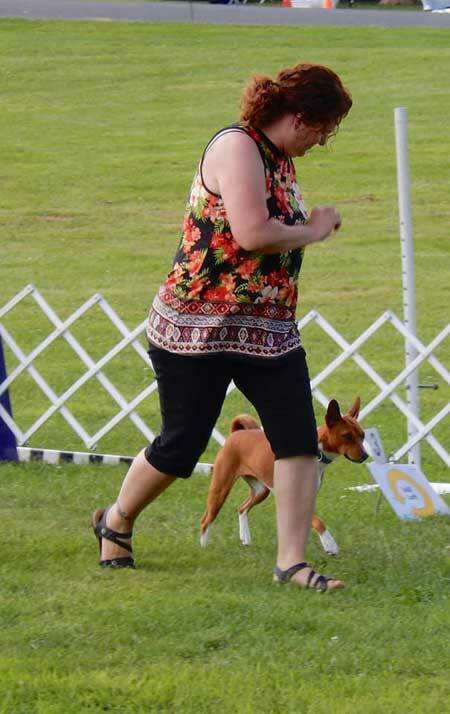 Susan Marsicano's Gilda got her GRC and ORC (straight racing and oval racing championships) & she got 4 CAA legs. She also got on the board with SGRC points and SORC points. 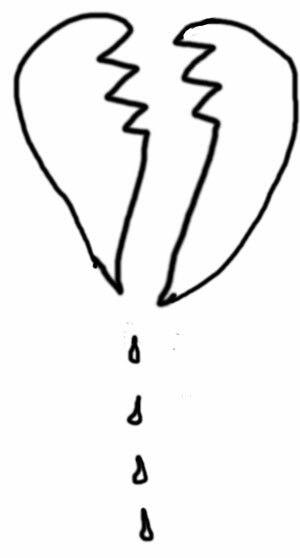 FC Apu Painter Song SC RN CA TKN GRC ORC JOR VBS2. 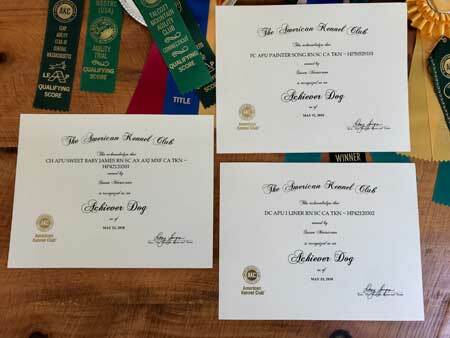 S K-M's Fiddle, Liner and Gilda are new AKC Achiever Dogs. 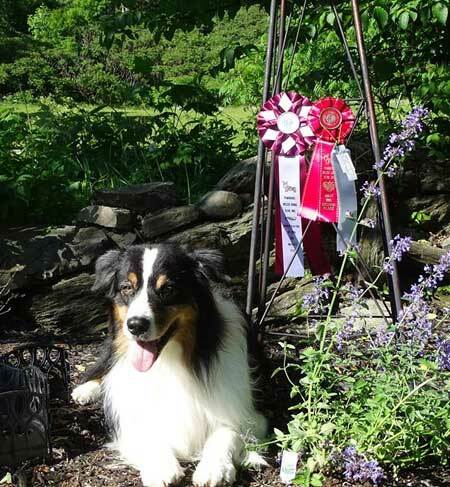 Renee Meriaux's Oakley now needs only 87 points for her PACH! She has her 20 QQ. Susan Marsicano's Fiddle got a 1st Place in Masters FAST. Andrea Stone's Phaser went to her first show and got a 3rd place. pf 4, + her sib got RWD. Big brother Turkish got a 4th in Rally Intermediate. 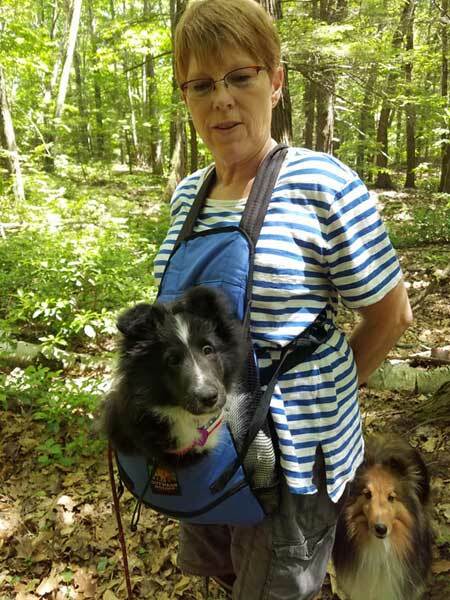 Beth Povinelli added Ida to Aqua Suede's family. Ida was bred by Katie Campbell.